We provide the very best dog home boarding near you in the Chester and west Cheshire area. Dogs deserve a holiday too! Hello! 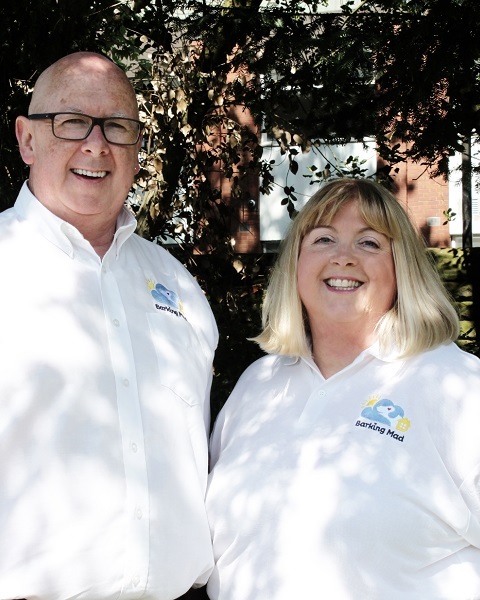 We’re Peter and Bianca and are proud to be your Barking Mad dog sitting representatives for Chester and Cheshire-West. We’d love to hear from you whenever you are looking for high quality dog home boarding. Fletch, our Border Collie, Peter (an ex-History teacher) and Bianca (an ex-Psychology teacher). We’ve made the move to our new life here in Cheshire and have opened up your first local Cheshire area branch of the famous Barking Mad Dog Care. We provide the best professional dog-sitting service you could ask for, covering from Ellesmere Port in the North, to Tarporely and Bunbury in the South and everywhere in between. What a beautiful county we all live in and how lovely we are finding life is, to be driving all over this area every day, meeting wonderful dogs and their lovely owners, and taking the dogs off to their loving Hosts for a holiday! Call this work? Our premium, home-boarding/sitting holidays for gorgeous family dogs in the Chester area. Our carefully chosen Hosts will give your dog a home-from-home holiday and all the walks, cuddles and general spoiling they could wish for, whilst you have to leave them. We take care of all the organisation, transportation and legal aspects of this, so that you can have a stress-free holiday, knowing your much-loved pooch is in the very kindest of homes, receiving love and care from our Hosts who are the most nurturant and dedicated dog lovers. We have worked hard to find the most wonderful Hosts for your dog to stay with and we fully support them 24/7, whilst your much-loved dog is out on their Barking Mad holiday with us. No lonely dogs languishing alone in cages for hours on end here; with us your dog is truly “on holiday” too, having lovely long walks, lots of play and cuddles on the sofa at night, with someone we have personally matched to your particular dog’s needs. Your dog will be the only visiting dog in their holiday home and this means they will be as well looked after as if they were home with you. We will keep you updated all the way, so you can see for yourself what a wonderful holiday your dog is having and this will help your own holiday go with a swing too. Check out our 5* Trustpilot reviews below to see how pleased others are with our service. So, if you are looking for a proven, premium-quality dog sitting service, which is professionally run and offers all the safeguards you could ask for, then look no further. We are always on the lookout for new hosts/dog-sitters, people who love dogs and would like to have a lovely dog of their choice to stay over, at times convenient to them and with our support and backing 24/7. Why not get in touch with us and we’ll come and tell you all about hosting for Barking Mad. All the fun and none of the hassle!